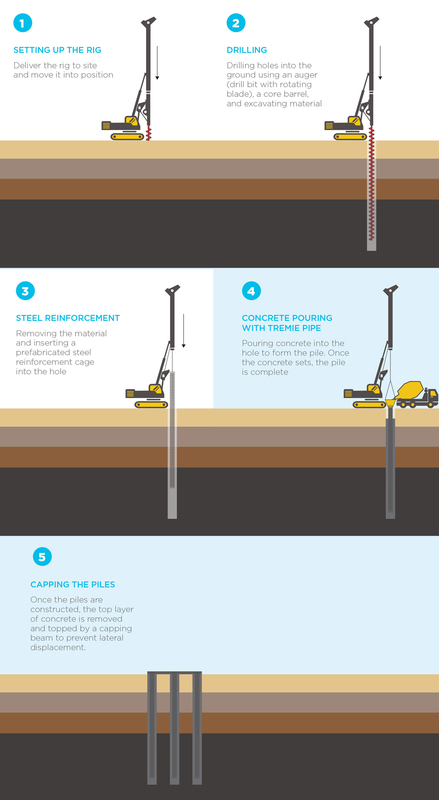 Before bulk excavation can commence, we need to install a series of piles to support some structures. To construct the new Parkville Station, a 30 metre deep box will be excavated using a construction method called ‘bottom-up’. The ‘bottom up’ method involves excavating the box down to its maximum depth, construction and fit out of the station, followed by the installation of mechanical and electrical equipment required to operate the station. The road surface is then reinstated over the top once the station is complete. Before excavation can commence, we need to install approximately 500 piles around Grattan Street, between Royal Parade and Leicester Street, to support the structure and enable workers to safely carry out excavation underground. 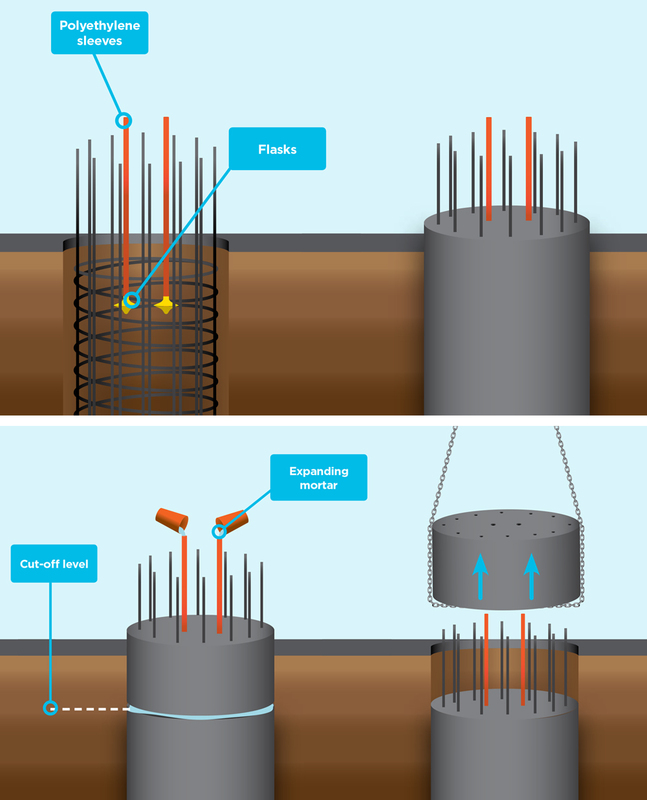 Once the piles are constructed, the top layer of concrete is removed and topped by a capping beam to prevent lateral displacement. As the piles are constructed, we will be using an innovative new method to break back the piles. The method involves the use of an expanding mortar to create pressure and generate a perfectly horizontal cut, so the top layer of concrete can be easily removed by a crane. This removes the need to use jack hammers and excavators in the pile break back process, reducing the noise, dust and vibration impacts on the surrounding community. Following the removal of the top layer of concrete, a temporary concrete capping beam is cast on top of completed piles to prevent any lateral displacement during subsequent excavation works. The top layer of concrete can then be removed using a crane and the breaking back of the pile is complete. Piling works started in May 2018 and are expected to be completed in October 2018. At the completion of piling, excavation will commence and continue until approximately December 2019. The use of heavy machinery such as piling rigs, cranes and excavators will generate high levels of noise and vibration at various stages of construction. While every effort is made to minimise impacts from construction, a project of the size and scale of the Metro Tunnel will have an impact on the comfort of people living, working or studying near construction sites.We recognise there are a number of sensitive receivers located close to the Parkville Station worksite, including residential, educational, medical and research facilities. Prior to works commencing, qualified consultants have undertaken extensive modelling of the predicted noise and vibration impacts to teaching spaces, laboratories, bioresources, sensitive equipment, hospital wards and residential buildings. This has allowed us to determine appropriate mitigation strategies, and discussions are continuing with key stakeholders to determine if any further mitigation measures are required. Mitigation measures may include (but not limited to) offering periods of respite, selecting less noisy equipment, shielding noise sources, and installation of acoustic timber hoarding around the site. Noise and vibration monitoring will continue throughout the project to inform the construction process, validate the modelling, and demonstrate compliance with the Metro Tunnel Environmental Performance Requirements (EPRs).